تحقیق درباره توده‌واری و تأییدِ وجود یا رد آن، همچنین تعیین نوع آن، اعم از عقلایی یا غیرعقلایی بودن، دغدغه محققان اقتصادی به ویژه طرفداران اقتصاد و مالی رفتاری بوده است. در این پژوهش ضمن بررسی مدل‌های اندازه‌گیری توده‌واری، به توده‌واری شرکت‌های سرمایه‌گذاری و تبعیت آن از احساسات پرداخته شده است. در این تحقیق دو موضوع مورد کنکاش واقع شده است. نخست، وجود توده‌واری که بر اساس مدل‌های LSV و امیرات - بوری، مورد تأیید واقع شد و در وهله بعد، تعیین جنس این توده‌واری است که اثباتِ تبعیت آن از احساسات می‌تواند راهگشای تأیید غیرعقلایی بودن آن باشد. در این تحقیق توده‌واری مدیران بیست شرکت سرمایه‌گذاری، از دو روش محاسبه توده‌واری مورد بررسی قرار گرفت. نتایج تخمین‌ها نشان می‌دهد توده‌واری از هر دو روش متأثر از احساسات سرمایه‌گذاری است. در این تحقیق از تحلیل مؤلفه اصلی برای تجمیع اثر احساسات استفاده شده است. This study Investigates to confirm either the presence or reject the herding behavior, it also determines the type whether rational or irrational, is an important concern of researchers, particularly for advocates of behavioral economics and finance. This study also examined the model for herding measurement in Investment Company; investigate subordination the herding from sentiment. In this study, two issues have been explored. First, existence of herding, that the model used was confirmed. The next phase is determination of the type of herding, which the following results show that sentiment can confirm that it is irrational. In this study, managers herding in overall investment company were studied by two methods. Estimation results show that herding is influenced by investor sentiment. The study uses principle component analysis as the means of extracting the combination sentiment measure. اسلامی بیدگلی غلام­رضا؛ شهریاری، سارا؛ «بررسی و آزمون رفتار توده‌وار سرمایه‌گذاران با استفاده از انحرافات بازده سهام از بازده‌کل بازار در بورس اوراق بهادار تهران طی سال­های 1380 تا 1384»، بررسی‌های حسابداری و حسابرسی، 1386، پاییز 14(49):25-44. ایزدی، ناصر و حاجیان نژاد، امیر؛ «بررسی و آزمون رفتار توده وار در صنایع منتخب بورس اوراق بهادار تهران»، فصلنامه بورس اوراق بهادار سال دوم، 1388، شماره 17. سعیدی، فرهانیان؛ مبانی اقتصاد و مالی رفتاری، نشر شرکت اطلاع رسانی بورس و دانشگاه علوم اقتصادی، 1390. 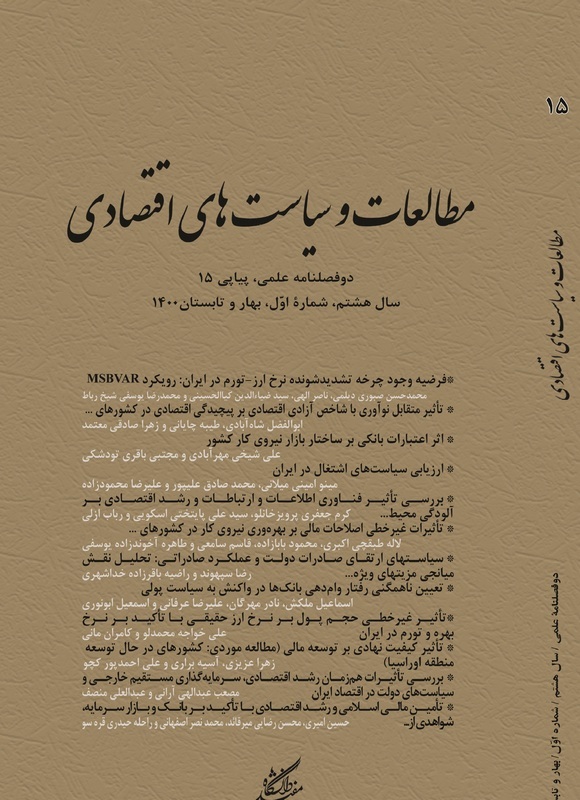 فلاح شمس لیالستانی، میرفیض؛ قالیباف اصل, حسن؛ سرایی نوبخت، سمیرا؛ بررسی اثر تجربه بر ریسک‌پذیری، بیش اطمینانی و رفتار توده‌وار، فصلنامه بورس اوراق بهادار سال سوم، 1389، شماره 12. Amirat, A. and Bouri, A; 2009, A New Measure of Herding Behavior: Derivation and Implications, World Academy of Science, Engineering and Technology 54. Baker, Malcolm & Jeffrey Wurgler; 2006, "Investor Sentiment and the Cross-Section of Stock Returns", Journal of Finance, 61(4), 1645-80. Baker, Malcolm & Jeremy C. Stein; 2004, "Market Liquidity as a Sentiment Indicator", Journal of Finance market, 7(3), 271-99. Barber, Brad, Odean, Terrance, Zheng, Lu; 2005, "Out of Sight, Out of Mind: The Effects of Expenses on Mutual Fund Flows", Journal of Business, Vol. 78, 2095-2119. Barberis, Nicholas & Shleifer, Andrei; 2003, "Style Investing", Journal of Financial Economics, Elsevier, vol. 68(2), pages 161-199. Bikhchandani, Sushil & Sunil Sharma; 2001, "Herd Behavior in Financial Markets", IMF Staff Papers, 3, 279-310. Brown, Gregory W. & Michael T. Cliff; 2004, "Investor sentiment and the near-term stock market", Journal of Empirical Finance, 11, January, 1-27. Brown, Stephen J., Willian N. Goetzmann, Takato Hiraki, Noriyoshi Shiraishi& Masa‌hiro Watanabe; 2002, "Investor Sentiment in Jap‌anese and U.S.Daily Mutual Fund Flows", http://ssrn.com/abstract_302829. Christie, G., and. Huang, D; 1995, "Following the Pied Piper: Do Individual Returns Herd around the Market? ", Financial Analysts Journal, No.4, Vol.51. De Long, J. Bradford, Andrei Shleifer, Lawrence H. Summers & Robert J. Waldmann; 1990, "Noise Trader Risk in Financial Markets",Journal of political Economics, 4, December, 38-703. Devenow, A., Ivo Welch; 1996, Rational Herding in Financial Economics, European Economic Review40 ,Pp. 603-615. Green, William H; 2000, Econometric analysis, fourth edition, Printic-Hall Inc.
Greenwood, Robin & Stefan Nagel; 2006, "Inexperienced Investors and Bubbles". http:// www.people.hbs.edu/rgreenwood/Mfage8.pdf. Hamilton, W. D; 1971, "Geometry for the Selfish Herd", Journal of Theoretical Biology 31(2): 295-311. Hwang, S. and M. Salmon; 2004, "Market Stress and Herding", Journal of Empirical Finance, No.4, Vol.11. Kamstra, Mark J., Lisa A. Kramer & Maurice D. Levi; 2003, "Winter Blues: A SAD Stock Market Cycle", American Economic Review,93(1): 1257-63. Lakonishok, Josef, Andrei Shleifer & Robert W. Vishny; 1992, "The impact of institutional trading on stock prices", Journal of Finance Economic, 32, August, 23-43. Lee ,Charles M.C, Andrei Shleifer & Richard H. Thaler; 1991, "Investor sentiment and the closed-end fund puzzle", Journal of finance, 46, March, 75-109. Liao, Tsai-ling, Chih-Jen Huang & Chieh-Yuan Wu; 2011, "Do fund managers herd to counter investor sentiment? ", Journal of Business Research, 2, February, 207-212. Markus K. Brunnermeier; 2001, Asset Pricing Under Asymmetric Information: Bubbles, Crashes, Technical Analysis, and Herding, Oxford University Press. Raafat, R. M.; Chater, N.; Frith, C; 2009, "Herding in Humans", Trends in Cognitive Sciences 13 (10): 420-428. Robert Prechter; 1999, The Wave Principle of Human Social Behavior, New Classics Library, pp. 152-153. Shiller, Robert J; 2000, Irrational Exuberance, Princeton University Press, pp. 149-153. Whaley, Robert E; 2000, "The Investor Fear Gauge", Journal of Portfolio Management, 26(3): 12-17.